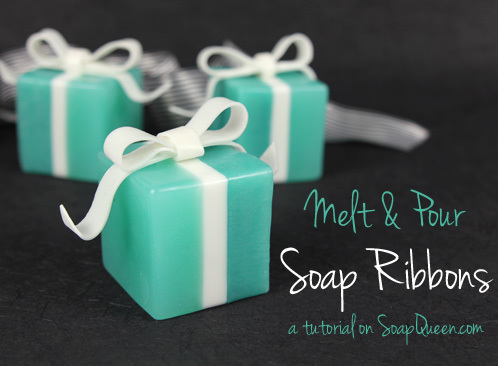 One of the great things about melt and pour soap is its versatility. It allows you to create intricate details, complicated patterns and in this case, cute little bows! The key to this project is adding extra liquid glycerin to the melt & pour base to give the soap extra flexibility to manipulate into bows. This project does take a little extra patience and a steady hand, but once you get the hang of making them they make for adorable embellishments on all kinds of soapy projects. ONE: Cut and melt 7 oz. of Shea Melt and Pour base and place in a microwave-safe container. Heat the soap on 10 second bursts until fully melted. TWO: Add .3 oz. of Love Spell Fragrance Oil, a few shavings of the Shimmer Light Gold Color Block and .4 oz. Liquid Glycerin and stir. THREE: Now here comes the tricky part! 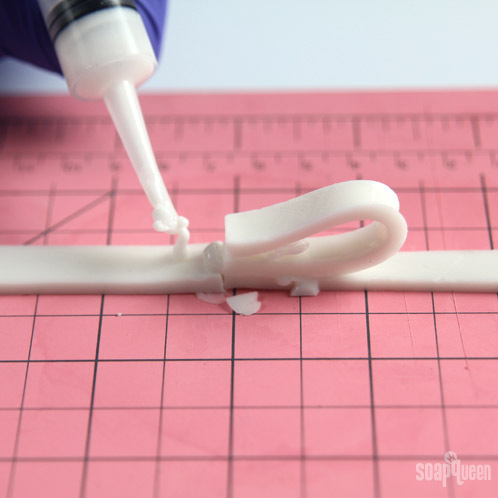 Pour a thin layer into the cavity of the 12 Bar Silicone Rectangle Mold. Pour only enough to just barely cover the surface of the cavity. 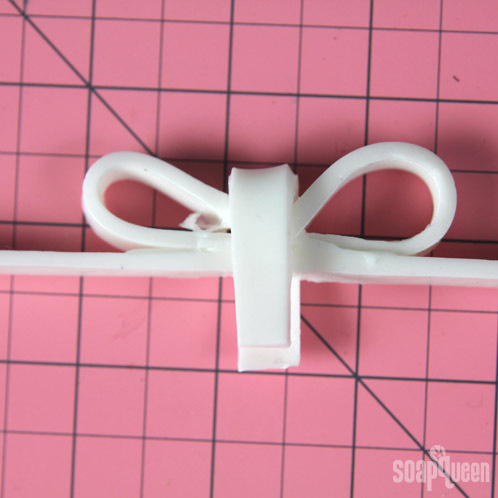 The thinner you pour, the easier it will be to manipulate the soap in the bow shape. 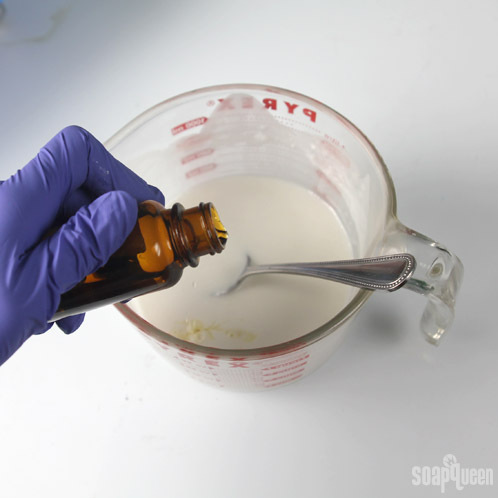 We found it helpful to spray 99% alcohol in the cavity beforehand to help the soap thin out. Be sure to spray with alcohol after too to disperse bubbles. We made enough white soap to fill 8 of the 12 cavities. 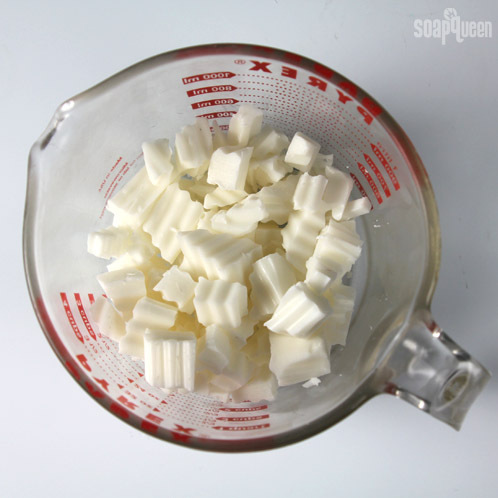 FOUR: Give the soap 15 – 20 minutes to dry and then unmold. Cut the soap rectangles into 5 equal sections. FIVE: Now start building your ribbons. This part can get a little messy, so lay down some parchment paper or other surface you don’t mind getting some melt and pour soap on. Bend one of the strips into a half-loop. Then, spray 99% alcohol liberally on a flat strip and place the loop on top. Use the injector tool to glue the two pieces together. SIX: Now repeat step 5 but for the second half of the bow. This part takes some patience, and you’ll need to spray plenty of alcohol and soapy ‘glue’ to get the two sides to adhere. Don’t worry if you get melt & pour all over your work surface in the process. 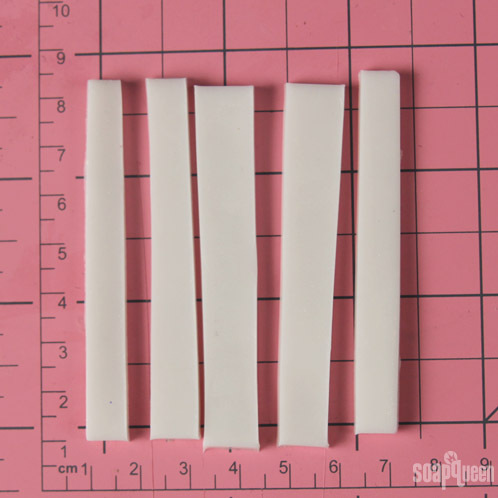 It’s better to have too much soapy glue than too little and have the sides come apart. SEVEN: Wrap the last strip of melt and pour around the middle of the bow. The two ends will hang over, so use an Exacto knife or other cutting tool to gently slice them off. 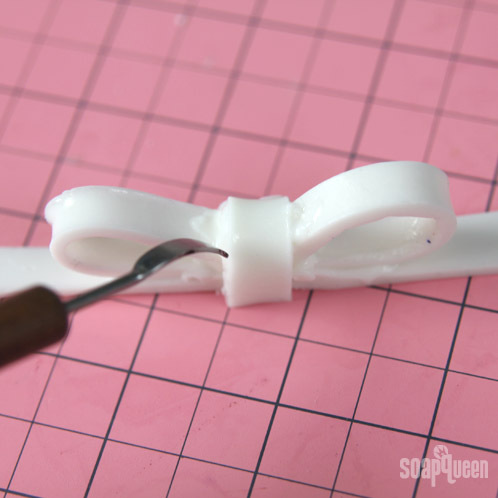 EIGHT: You may have excess soap all over the bow from gluing all the small parts together, so use a Clean Up Tool to gently pick them away. NINE: Once you’re satisfied with the bow, it’s ready to use! 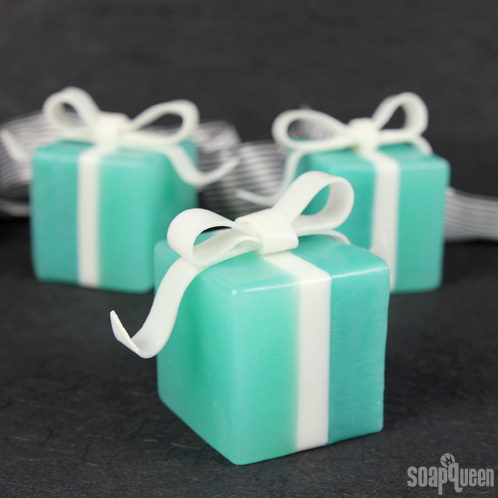 We placed ours on little melt and pour soap ‘boxes’ made with the Clear Melt & Pour Base in the 9 Cube Soap Silicone Mold and colored with Aqua Pearl Mica. Start making the boxes by cutting and melting 40 oz. 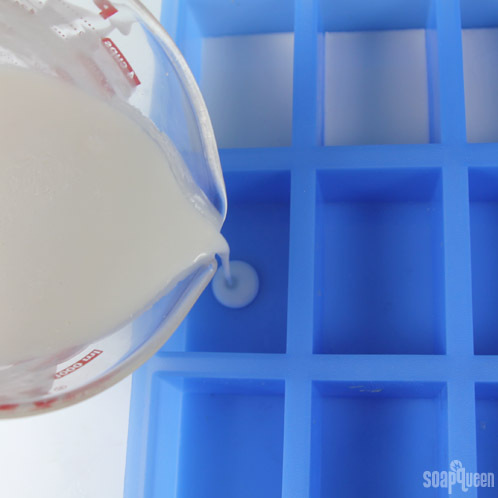 of Clear Melt & Pour Base in a microwave-safe container on 30 second bursts. Fragrance with 1.2 oz. of White Tea and Ginger Fragrance Oil. Color with a mixture of 2 tsp. Aqua Pearl dispersed in 1 tbsp. Isopropyl Alcohol. 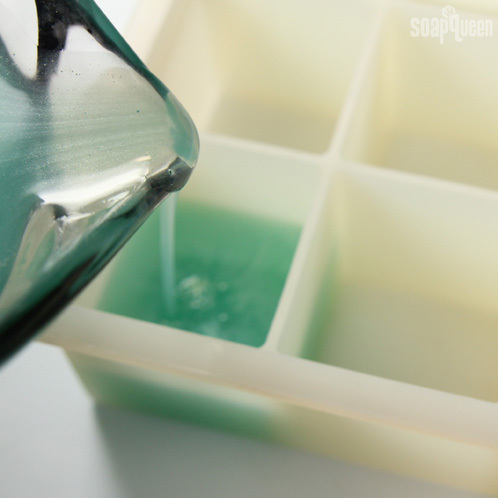 TEN: Once the fragrance and color are fully incorporated, fill each cavity about halfway with aqua-colored soap. Spray with isopropyl alcohol to disperse bubbles. 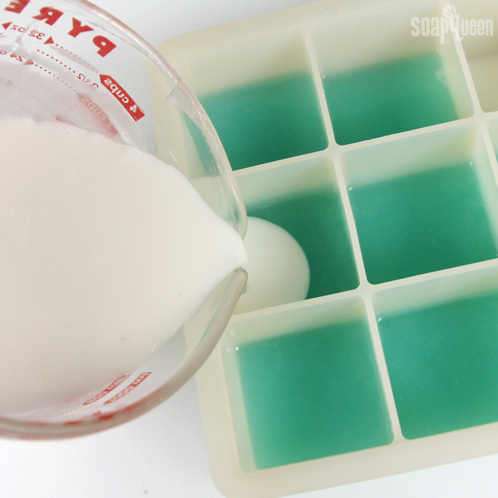 ELEVEN: Give the soap 30 – 40 minutes to dry. Meanwhile, cut and melt 10 oz. of Shea Melt & Pour in a microwave-safe container on 10 second bursts. 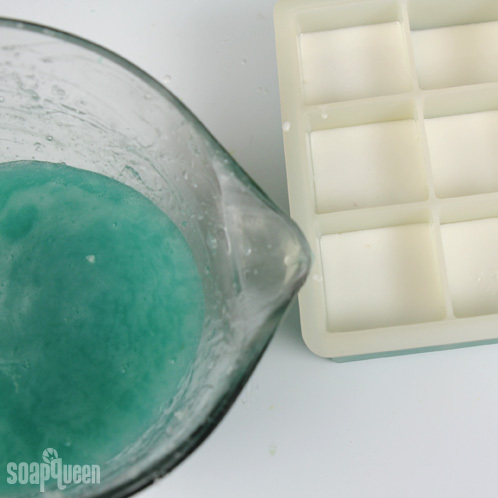 When the aqua soap has formed a thick skin and the white soap has cooled to 125 degrees F or below, spray with the aqua soap with isopropyl alcohol and then pour a thin layer of white soap in each of the cavities. Spray with alcohol to disperse bubbles. TWELVE: When the white soap has formed a thick skin, reheat the remaining aqua soap. 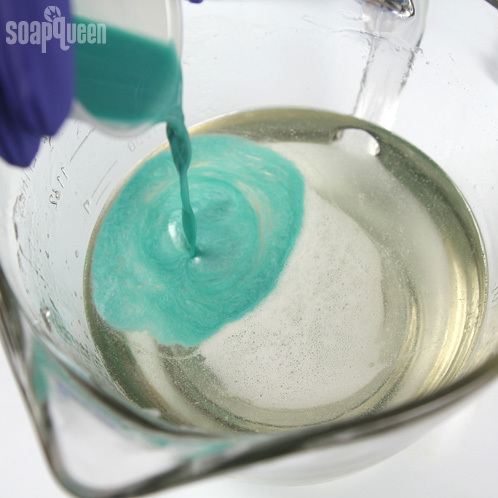 When the aqua soap has reached 125 degrees F or below, spray the white soap with alcohol and then pour the aqua soap. Spray again to disperse bubbles. 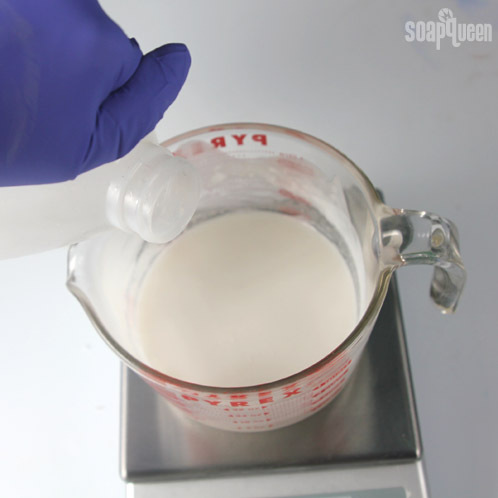 Allow the soap to fully dry for 45 minutes before unmolding. Top off the soap cubes with the bow and you’re all done! I love your goat milk M&P base! Would it work instead of the clear base M&P? Also, you stopped carrying Aqua Pearl Mica, could you please suggest another colorant to achieve the same color? Thank you so much for your help! Also, a mix of Hydrated Chrome Green with a touch of Super Pearly White Mica creates a lovely color that’s similar to Aqua Pearl! I think these are adorable and perhaps a cupcake box would work for packaging? I can’t wait to make these! Thank you so much for another creative idea! Hi! I ordered the summer 2014 Soap Crafting Club and I can hardy wait! I have a question about melting my melt and pour soap. Is it possible to heat the melt and pour and have it so hot that it burns off or out the fragrance oil? I made some soap bars and (the soap did get really hot) after I took the bars out of the mold there wasn’t hardly any scent in them. Any help that you could give me would be greatly appreciated!!! It is possible to burn off the fragrance depending on the oil’s flash point. For instance, Black Raspberry Vanilla Fragrance Oil has a flash point of 186, meaning if it gets hotter than that the scent will fade away. These are adorable. Thank you for the cute idea AND the directions! I figured out how to make “Tiffany” boxes last Christmas, but I love this to use my barely used cube mold!! Thank you so much for that idea and how to make a simpler looking bow than all those curls I did before. Maybe this smoother style will be easier to ship! The test will come to see how patient I am learning to use the “glue” LOL! I just love you guys. I’m so glad you enjoyed this tutorial :). It’s true, this a rather delicate project, and shipping could be a little tricky. If you have photos of your project from last year, I would love to see them on our Facebook page! It sounds like they were really cute :). Creating the bows does take a little patience, but I think it’s totally worth it! Hi soap queen yr majesty!😁 love all your soaps but most of all you make me giggle, great fun to watch you…….wish you lived around the corner!! Oh thank you! So glad that the projects bring a smile to your face. We have such fun creating them =) They are absolutely giggle-inducing here too. Thank you for being part of the Soap Queen community. That is so stinking cute haha! And creative! I’m so glad you enjoyed this tutorial! It’s a new favorite project of mine :). I hope you give them a try! Would love to see some packaging ideas for these. Would would you suggent, clear plastic bags. These are sooo cute. Oh my goodness that’s so sweet! I love having new MP projects to try. I hope you do try this project! It’s a lot of fun :). Be sure to share some photos with us if you get the chance! wowww…..but how do you make the soapy glue? is that from the melted melt n pur base? So adorable! I’m going to try these right now!